Usually, we evaluate video games based on how they play, look, and make us feel. Today, we’ll be critiquing them based on entirely different criteria. See, we want to know exactly who made some of the biggest games of 2015 and 2016. And we want to know just how easy it is to find that information. So we spent the past few days experimenting with a wide swath of games, from big AAA RPGs to tiny indie gems, to see just how difficult it is to see their credits. Then we gave them scores, of course. When you load up CD Projekt Red’s stellar role-playing game, you can find the credits by going into “Options” on the main menu and then selecting “Credits.” This is fine, although a word like “Options” doesn’t exactly signal that you’re about to see who made the game. As far as I can tell, to see the credits on last month’s indie darling you have to beat the game, which takes like 3-4 hours and is therefore way more difficult than it should be. The credits for the third Diablo game require you to load up the game, select “More,” and then select “Credits.” Solid. Again, Options->Credits. Probably the longest credits sequence we’ve seen to date. One of this year’s best games hides its credits in a tricky, brilliant puzzle that most players will never solve. This is a cool easter egg, but also the most inaccessible credits sequence we’ve seen so far. Batman’s latest game lets you see the credits by going through the “Extras” menu, which is kinda cheeky. Seeing who made the game counts as an extra? I looked pretty hard but couldn’t find any way to see the credits in Halo 5's menu, which was pretty surprising. I guess you have to beat the game? Shame. Same boat here. As far as I can tell, you can only see the credits in Nintendo’s latest Zelda game by finishing it, which will likely require you to work together with two other people. No credits option until you beat the game, as far as I can tell. Knowing Bloodborne, there’s a secret credits menu that you can only access by talking to one specific villager at the stroke of midnight, and nobody’s found it yet. You have to beat the game to see the credits, and then you have to beat the game with the true ending to see the true credits. There’s an option to watch the credits on the main Director—you know, the menu where you can select planets and missions?—but when you click on it, it tells you that the credits are actually on Bungie’s website. Just like the story. You pretty much need an NFL playbook to find the credits in Madden. You have to go to Customize, then Extras, then Watch Credits. By the time you’ve finished, they’ll have released a new Madden. This is a weird one. 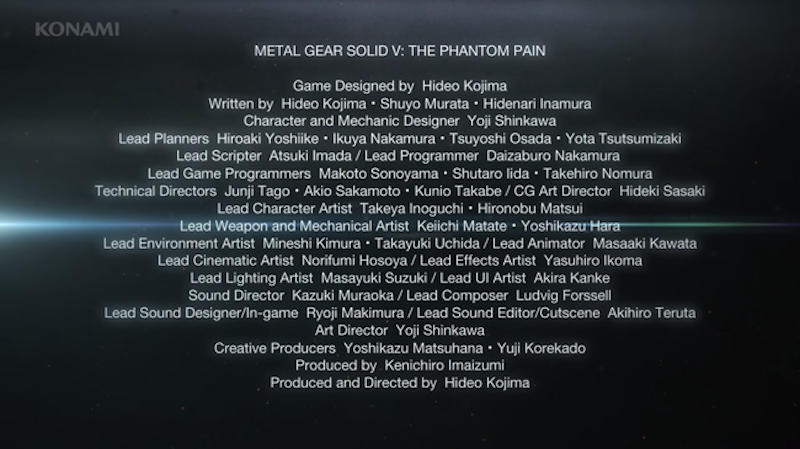 There are partial credits before and after every mission, but those only comprise a fraction of the developers who created Metal Gear Solid V, which will be the final Metal Gear game helmed by Hideo Kojima. To see the full credits, you have to go back to mission 31 and beat the boss, which is kind of a pain. Konami!!! The developers at DICE snuck their credits into the “Settings” menu, which is also weird! Why are credits a setting? It feels like they just didn’t have any place else to put it? Menu -> Options -> Credits. Pew pew. This co-op indie game makes it pretty easy to see who made it. Just go to “Help & Options” and then “Credits” for the full list.